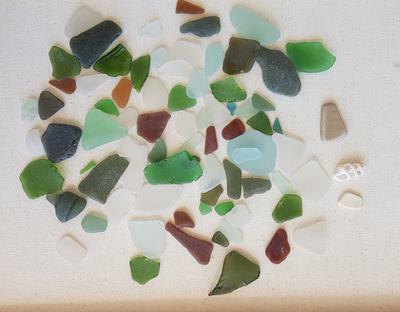 We spent about an hour on the beaches adjacent to Freemantle, near Perth, WA and found a wonderful array of well-tumbled glass. We were there in early April on a cool, windy day at mid-tide. The beaches are sandy with pockets of gravel and it's in these pockets of gravel that the sea glass sparkles. We found a nice array of colours, including sea green, clear, light and darker blues, good range of greens, a small number of the very dark greens (black), and lots of ambers and browns. We tend not to collect much of the latter as we have an adequate supply right now for my wife's jewellery. There was also a scattering of pottery pieces. The glass ranged in age from early to late 20th century and the large majority was well-worn with good patina. About 20% would qualify as "jewel" quality while the rest was of good "craft" quality.